Discussion in 'Magazines' started by Miss Dalloway, Apr 3, 2009. Scanned by TFS member BLACKLAB, huge thanks. Ya but thats a good thing hahah, i quite like the cover to be honest specially the fading colours. I find her utterly insufferable in person, but in print she's turning into a relatively good model. 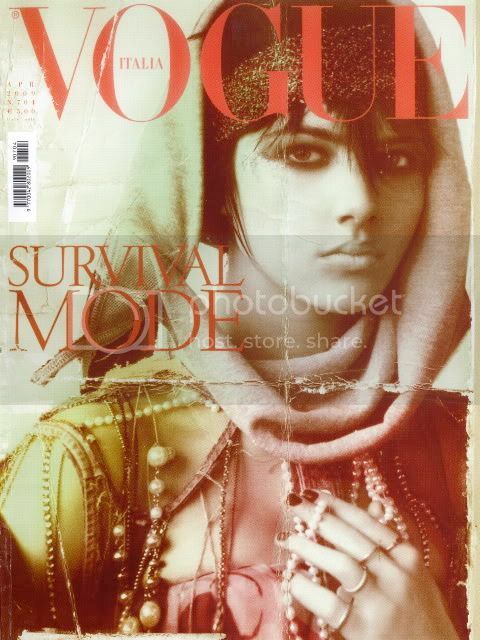 Though the credit should be given to Meisel and his retouchers for making this such an amazing cover. It feels like old school Vogue Italia, and I love the texture of the folds and that gorgeous gradient. Not bad I must say...she looks actually like a woman and I love the vintage effect. I can't stand how much i love this.I can't stop looking at it.I loooooove it. Wasn't expecting anything like this at all. Kudos to Meisel. i don't think the story inside lives up to the cover. Would you mind doing a review of contents for us ? Is there a chance you could give us a review of the issue? And thanks again for scanning the cover for us, its appreciated. Wow! She looks stunning! But once again, black and white dullness. It's a very dated looking cover too- the styling is totally irrelevant. The only thing I like about it is Eliza's gorgeous face. She looks so much softer than she has looked on the covers of i-D and Dazed and Confused. And her eyes are so deep and sultry. Maybe she is a good model after all! Hahah, that's a funny cover. And good, too. I can't believe it, but I love this! Effects and styling are amazing. It just WOW! I don't really get the point in Eliza, the only good reason a photographer should have for shooting her is because of her image and if they are going to say true to that. It's not as if she has model features worthy of an Italian Vogue cover.